Ethridge and Richerson produced a haul of 24.07 pounds to take away the $5,000 first place prize. 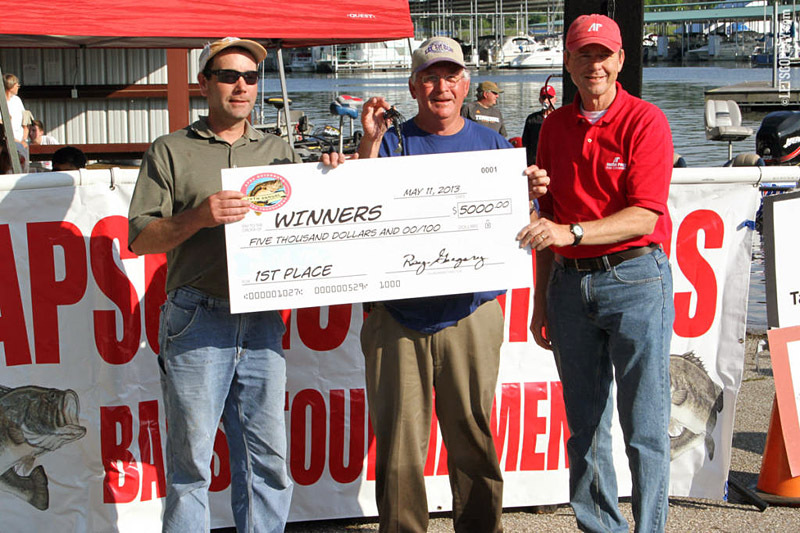 They edged Rodney Tidwell, of Murray, KY, and Randy Stone, of Kirksey, KY, who were at 24.01 and took home $1,500. Ethridge and Richerson also claimed the Big Bass pot (7.24 pounds) of nearly $1,500. The first-time entrant of Michael Prince and Wendy Sandmoon, of Camden, was third ($1,000) with 23.88 pounds but were penalized a quarter of a pound because of a dead fish in the live well. Although it cost them the championship Sandmoon was all smiles afterward when her name was drawn for the grand door prize drawing of a 150HP Mercury FourStroke motor, valued at more than $13,000. Terry Young (23.73) took fourth place and $600.00—he also was second in the Big Bass pot (7.23 pounds)—while Adam Fewell and Hunter Hood (22.48) took fifth and claimed $400.00 in prize money. Recent rains caused flooding in the area and boaters were forced to use the back entrance as high water forced closure of the main entrance. That didn’t stop 282 boats—18 more than a year ago—to register for this year’s tourney than in 2012. Seventy boats registered Saturday morning. Copyright © 2008 Discover Clarksville Tennessee. All rights reserved.